I colored the entire image with Copics, just adding a bit of white Inkssentials pen for foam on the waves and a little Stardust glitter on the water and drink (which I didn't manage to capture in my picture). Pile It On - "Lots of Dots" (circles, spots, etc. - think ROUND) and combine with at least 1 other challenge - I used a polka dot paper for my background and the main image was cut into a circle. Other materials used: patterned paper - Imaginisce (A Shore Thing collection); Barely Banana cardstock - Stampin' Up! 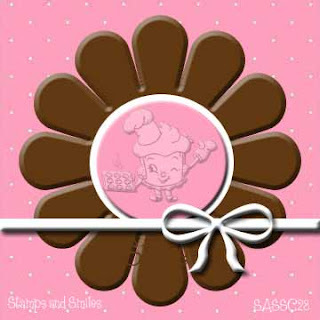 ; dark red cardstock - Bazzill; ribbon - Pink Hedgehog Paper Crafts; charm - eBay. La-La Land Crafts Peeks and Candy! To celebrate the release, Irina will be giving away one of the new stamps - winner's choice! 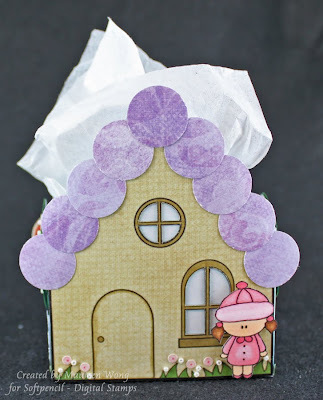 You'll find the details on how to enter on the La-La Land Crafts blog. The winner will be drawn next Thursday, September 3rd, at around 10 pm PST. Good luck! I used the Cupcake Mix & Match set and a sketch from Get Sketchy. I paper pieced the cupcake liner and top and then added some seed bead sprinkles. 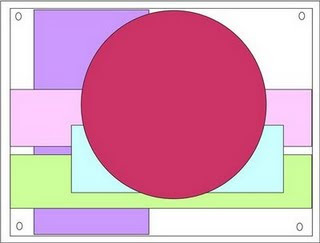 The scalloped circle was lightly airbrushed for just a bit of color. I hope you like it and TFL! Other materials used: patterned paper - Basic Grey (Two Scoops paper pad); border punch - Martha Stewart; ribbon - May Arts. 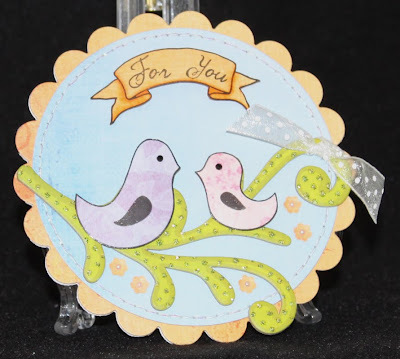 I've wanted to use this piece of swirly chipboard for a while, but couldn't fit it on a card until I saw the Loving Birds image - I saw the swirly branch they were sitting on and immediately thought of this chipboard! I paper pieced both birds and sat them on the chipboard branch with foam tape. To mimic the image, I punched little flowers and added tiny half pearls to the centers. 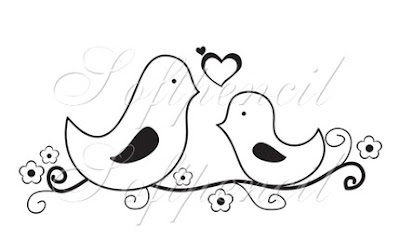 To meet the Design Element "shining, glittering, shimmering," I applied Stickles to all the dots on the chipboard, used Stardust glitter pen on the bird outlines, wings, little flowers and the sentiment. I also stitched around the circle with a combination of white thread and iridescent tinsel that I bought for Christmas ages ago. You can't see it in the picture, but in real life it definitely shines, glitters and shimmers (please take my word for it)! Digital Tuesday Challenge - Hop To It! (creation using something that hops). I know people wouldn't normally think of birds right off the bat, but they definitely do hop! I hope you like it and TFL! Don't forget to hop around to all the other DT and Guest DT members (links in the sidebar) to see what they've done with this fabulous image! Other materials used: patterned paper and chipboard - Fancy Pants; sentiment - The Greeting Farm; circle and scalloped circle Nestabilties; Copic markers (used to shade the sentiment banner); ribbon - May Arts; flower punch - Fiskars; micro half pearls - eBay. Yay! It's Wednesday so that means another La-La's Weekly Wednesday Challenge! This week Lisa chose our theme, which is stitching. It can be machine stitching, hand stitching or even faux stitching. I *love* stitching on my cards so this was a really great challenge for me! I did a bunch of straight and zig-zag stitching with some fun variegated pink thread that I had in my thread box. If you enlarge the first picture, you can see that I embossed the light yellow panel with the Flowers Impressabilities from Spellbinders. I also used some silk flowers I've had in my stash forever and a hanging charm (because I'm obsessed with charms right now!). We'd love to have you play along with us! 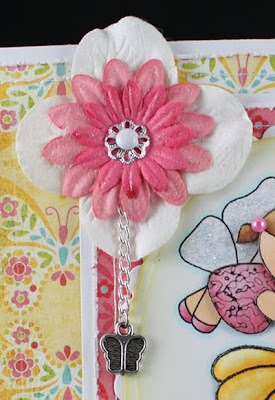 You will find all the details on how to participate on the La-La Land Crafts Blog. I hope you like my card and TFL! Other materials used: patterned paper - Basic Grey (Lemonade paper pad); Around and About Sentiments set, Scarlet Jewel cardstock and ink - Papertrey Ink; border punch - Martha Stewart; white brads (that I colored pink with Copics) - Pink Hedgehog Paper Crafts; bead caps and chain - Firemountain Gems; charm - eBay. I just came across a brand new stamp company called Your Next Stamp (how clever is that?!) and instantly fell in love with their images! They are SO my style (really cute and fun) and I love how they come in little sets with coordinating images and sentiments! I had to place an order right away, so I'll be sharing cards with these images soon! You can see my coloring skills a little better with these close shots. 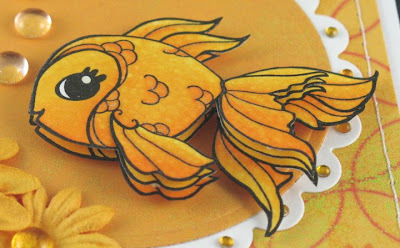 For this card, I dotted the colorless blender pen all over the fish to look like scales. I also added some glitter pen and lots of dimension. If you'd like more details, here's the original blog post. Although the notebook is pretty simple in design, I really love how the coloring came out! I'm always trying to improve my coloring skills and this girl turned out exactly how I wanted! Finally, to Karen and anybody else that may be looking over the DT submissions: I just wanted to mention that although Copics are my first choice for coloring, I also love using watercolors, and I recently learned how to color with colored pencils and odorless mineral spirits. 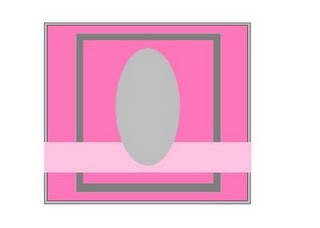 Thank you very much for checking out my post and considering me for the design team! 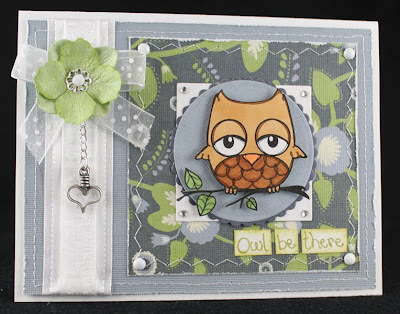 Other materials used: patterned paper - Basic Grey (Lemonade paper pad); Petite Oval and Petite Scalloped Oval Nestabilities; border punch - Martha Stewart; flower die - Cuttlebug; buttons - Papertrey Ink; Dew Drops. I printed 2 of everything - house, tree, bunny and girl, and I also paper pieced the houses and tree tops. For the roofs, I punched 3/4" circles from patterned paper to go over the circular pattern of the images. I rounded each circle and popped them up with scrap cardstock for dimension. The back is exactly the same except the roof color is slightly different. You can see that I cut out the windows and glued plain cardstock behind them. I also used a 1/8" hole punch for the little pink flowers, and dotted each with a pink pen. Lastly, I sewed seed beeds over the little dots in the design for interest. The girl was colored with Copics, cut out and mounted with foam tape. 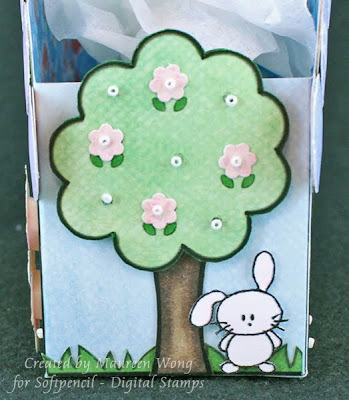 Our Design Element this week was flowers, which was easy since there were flowers already in the design of the tree! I used a Fiskars hand punch for the little flowers and then sewed seed beads to the center of each flower and also over each dot in the design. The grass was cut from extra houses that I printed. The bunny was colored just a bit, cut out and popped up with little bits of cardstock. I made up the box design based on the sizes of the house fronts and the trees. I hope you like it and TFL! 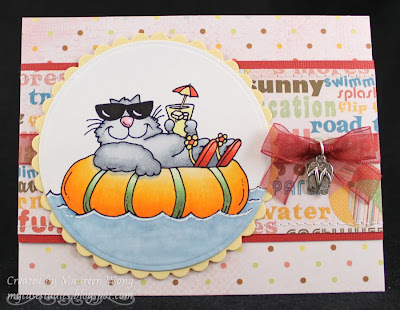 Don't forget to hop around to all the other DT members' blogs, including our fabulous Guest Designers (links on the sidebar) to see what everyone did with this great set! First La-La's Weekly Wednesday Challenge! You must have at least one flower somewhere on the card. It can be Prima flowers (or similiar), pressed flowers, embossed flowers, stamped flowers, etc. The challenge is to use your flower(s) in a way where it stands out but the main focus should still be your stamped image. To kick off our very first challenge, everyone that participates this week will be entered into a drawing for a FREE Window La-La stamp! And for this week, the one with the most votes from the team will get 25% off at the La-La Land Crafts online store! 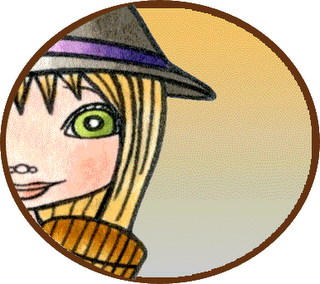 You will find all the rules on how to participate on the La-La Land Crafts Blog. 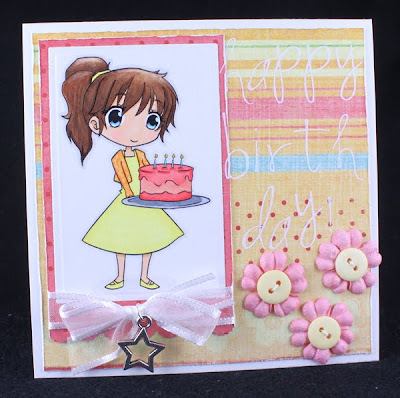 I used Birthday Lala and some Heidi Grace papers. Lala was colored with Copics, cut out and mounted with foam tape. If you look at the original Birthday Lala image, you'll notice that I gave her a little haircut! I just felt like giving her short hair for this card! I also colored and cut out an extra present with hands attached and mounted that with foam tape over the main image. For some extra pizazz I put some Stickles on her hair pins and shoes (done with a needle to get into the really tiny areas) and also on the flower button. For the flowers, I used 2 sizes of Prima hydrangeas, and a rose from Paper Wishes. I put some Stardust glitter pen on the hydrangeas and moved it around with a water brush. Don't forget to check out the fabulous creations of all my fellow DT members (links on the sidebar). I hope you'll join us this week and TFL! I wanted to play in the In Style Stamps Wednesday Challenge, but the theme is Back to School and I didn't have any suitable images from In Style. Then I thought maybe I could alter the Mellie image by covering up her birthday cake with some apples and it worked! I stamped a bunch of apples from The Greeting Farm's Wishing Tree set, colored with Copics and cut them out. 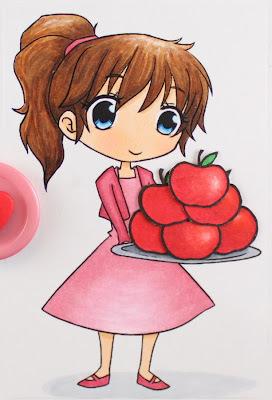 I colored Mellie with Copics and then glued all the apples over the cake. It's like she has an apple for each of her new teachers! I finished off the front with a piece of paper taken from the book and punched with the notebook paper punch, a bit of patterned paper, ribbon and a couple buttons. BTW - the notebook is about 3.25" wide and 4.5" tall. 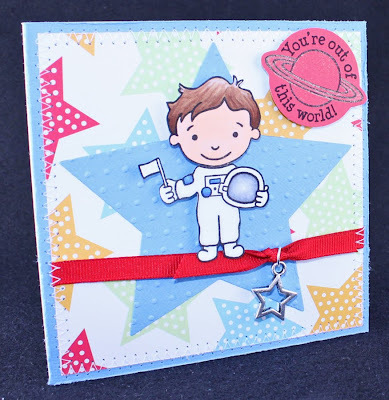 Simon Says Stamp challenge - Anything BUT a card. 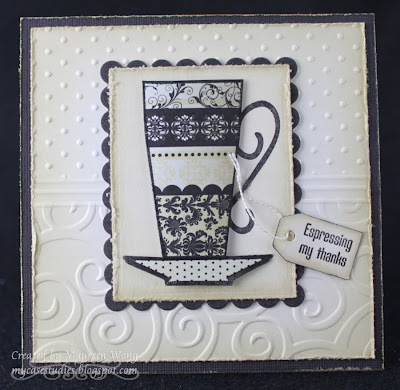 I used the set Coffee with Friends and papers from the DCWV La Creme stack. I paper pieced the cup and saucer with 2 different papers and did some inking and distressing on most of the pieces. This card was also made for the Timeless Tuesday challenge, which is scoring. I did 3 lines of scoring on my vanilla base to separate the dots and swirls embossing. Lastly, the sentiment is from There She Goes. I hope you like it and TFL! 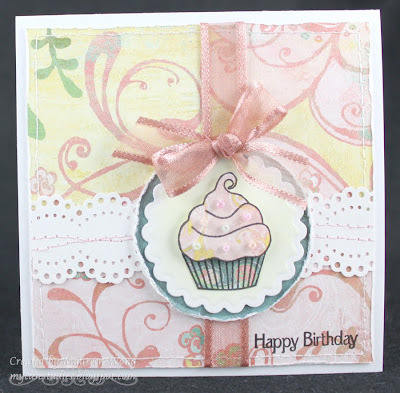 I love the Hope Stamps Eternal Cupcake Inspiration Challenges so I was *thrilled* when I was asked to be the very first Guest Sweetie!! 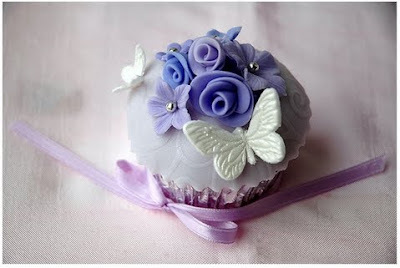 I was inspired by the swirls (looks like the Cuttlebug folder was actually used on the cupcake top! ), the pearly butterflies, the roses, and the colors. Finishing details: I embossed the plain circle with the D'Vine Swirls folder, distressed all the edges just a bit, did some machine stitching, and added rhinestones to all the corners. 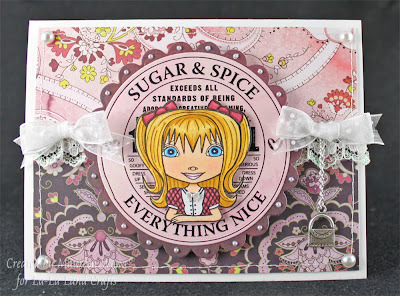 The sentiment is from Papertrey Ink's Mega Mixed Messages set and the heart charm is from Blue Moon. 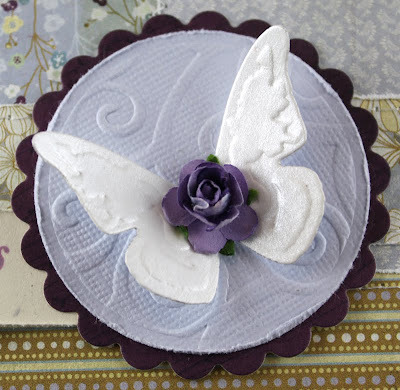 Lastly, this card is also for Flutter By Wednesday - create a card using a butterfly or fairy. A big huge thanks to Rachel & Michelle for asking me to be a Guest Sweetie!! I hope you like it and TFL! 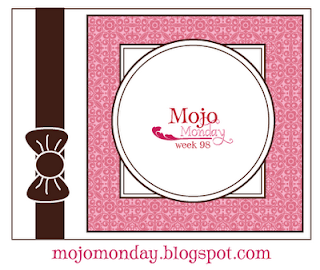 If you're looking for this week's Pile It On card, it's the post directly below this one. Thanks! 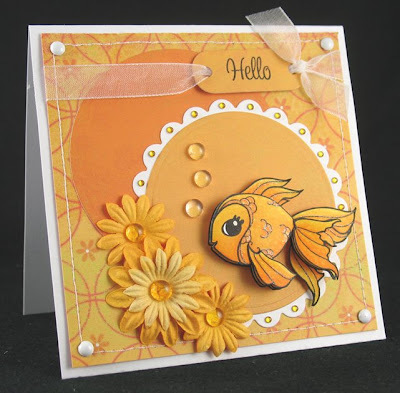 I used Window Lala and a fabulous Basic Grey rub-on that Irina sent in my DT package. 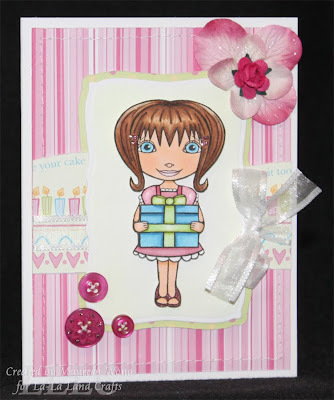 I added a lot of embellishments to make it a really girly card. You can click to enlarge the first picture to see everything! P.S. I also wanted to let you know that starting on Wednesday, August 19th, we will be having weekly challenges on the La-La Land Crafts blog called La-La's Weekly Wednesday Challenge. Please stop by and check it out! Other materials used: patterned paper - Basic Grey (Eva collection); ribbon - May Arts; bigger pearls - Kaiser Craft; tiny pearls and little bow - MimiLolo Etsy store; chain - Firemountain Gems; charm - eBay; lace from stash. I already bought the Lily & Billy Accessories set a while back on sale so I used the astronaut suit and sentiment with Billy. He was colored with Copics, cut out and popped up with foam tape. The big star is a Nestie that I embossed with the Swiss Dots folder to match the patterned paper, which is some REALLY old stuff from American Crafts. I added Stardust glitter pen to the planet, some grosgrain ribbon, a charm and zig-zag stitching to finish it all off. 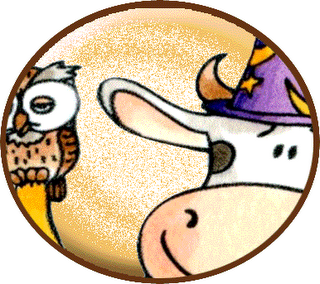 For this week's Softpencil card, I have a new character to introduce you to - say hello to Timmy! 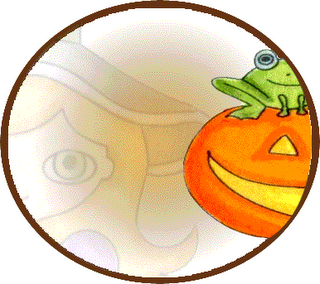 If you hop around to the other DT members' blogs, you should be able to find Tommy too! We also got to use these great Softpencil digital papers. I just sized down the papers a little and printed them both on the same sheet of cardstock as my Timmy image. I colored Timmy and the toys with Copics, and then inked and distressed all my pieces. Since this is a boy card, I used twine and star eyelets instead of my usual ribbon and flowers! I also added a star charm to keep with the star theme. 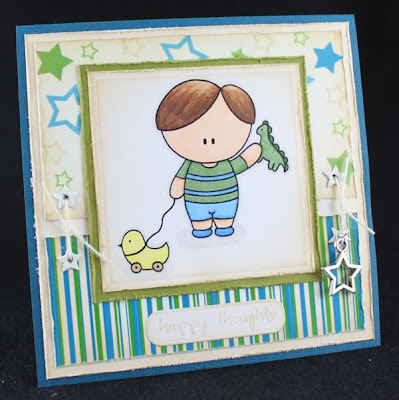 Other materials used: sentiment - The Greeting Farm; blue cardstock - Bazzill; Old Olive cardstock - Stampin' Up! ; twine - Papertrey Ink; charm - eBay; eyelets from stash. 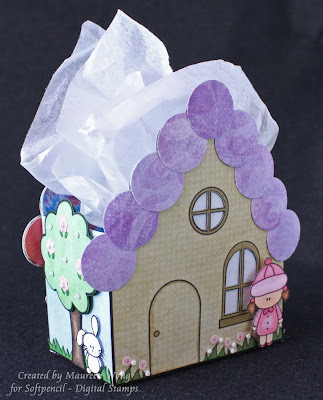 As soon as I saw this post on the Hope Stamps Eternal blog, I was instantly inspired!! An idea popped into my head and I was able to make this card in less than 10 minutes - the fastest card I've ever made! What inspired me was how Rachel combined the SCS CAS Challenge 27 (bling) with the Fall To Layout #54 on the Clean & Simple Stamping blog. I loved the FTL and the idea of using some bling to jazz it up! I love the look of CAS cards, but I never seem to do them, so a big thanks to Rachel for the inspiration! 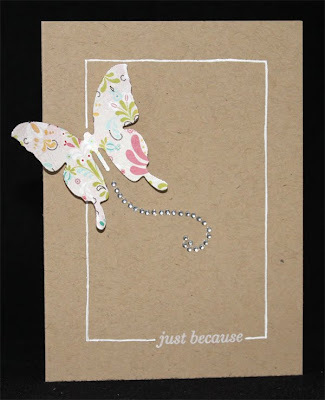 Materials used: sentiment (Simple Little Things Limited Edition set), kraft cardstock, Fresh Snow ink - Papertrey Ink; butterfly diecut - Spellbinders; bling - Prima; white Inkssentials pen. La-La Land Grand Opening News! Tomorrow is the Grand Opening of La-La Land Crafts!! The website will go live at 11 pm PST and you can get a 10% discount storewide for the first 24 hours!! And just to remind you, the celebration will start with the reveal of the stamps at Cranberry Hill Mercantile in Sunnyvale, CA. The party is scheduled from 6 pm to 9 pm (see details here). As a special treat for those of you going to Cranberry Hill, Jane Matsumoto, our Design Team coordinator, will be doing a make-and-take at the store. We hope to you see you all tomorrow at Cranberry Hill or in the online store - happy shopping!! Belles 'N Whistles Blog Candy Supreme! 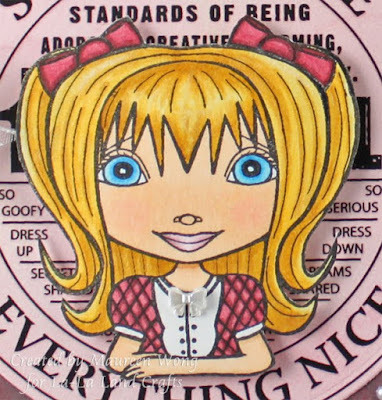 You need to check out the fab blog candy that Elisabeth Bell is giving away right now - the 6 premiere stamps from Belles 'N Whistles! PLUS a T-shirt of the winner's choosing from Elisabeth's line - how cool is that?! This candy closes on midnight, Sunday, August 23rd Arizona time. Good luck! You can see I changed up the sketch just a bit - putting my big sentiment in place of the three strips and then replacing the sentiment area with a ribbon and bow. 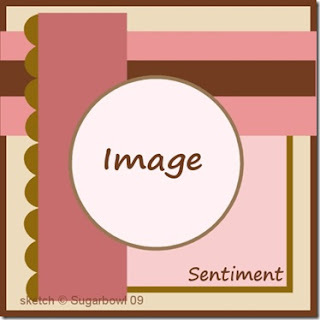 I used the digi stamp image Mellie from In Style Stamps (LOVE their anime images!) to qualify for their Wednesday Challenge - use buttons and an ISS image. I flipped her so she's facing right instead of left to fit the sketch - one of the great things about digi images! 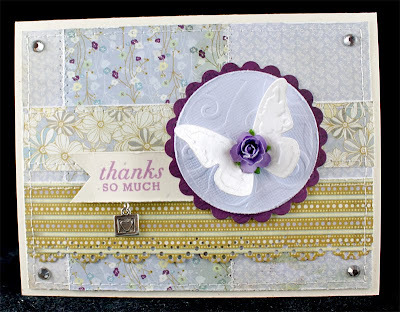 Other materials used: patterned papers - Fancy Pants (Celebrate collection); rub ons - Making Memories; flowers - Prima; buttons - Papertrey Ink; ribbon - May Arts; scalloped scallops border punch - EK Success; charm - eBay. I've been making a lot of big (for me anyway) square cards lately (5.5") so I wanted to do something a little smaller (4.25"). 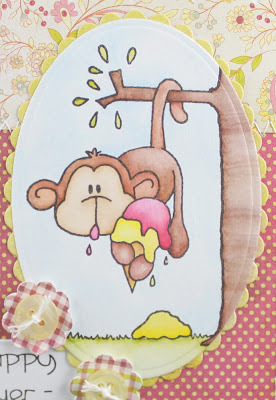 I thought the little bear from the Gorjuss girl stamp Bear Hug would be perfect for a smaller card and he was! He was colored with Copics, cut out and popped up with foam tape. Besides using the sketch, we were also asked to doodle on our projects - ugh! I'm not big on doodling (except for the couple hand drawn frames I've done recently), but I figured if I had to do it, I might as well do a bunch! So I put little heart shapes with a Copic on the focal panel's scallops, and then drew over them with a black liner pen. I also drew little swirls on the side scallops, some funky little corners, and lines and dots on the top strip. I have to say I'm not thrilled with the end product, but at least I tried! I finished the whole thing off with a lot of machine stitching, some May Arts ribbon and a beaded pin. BTW, I got the idea to put that silver basket bead cap on the pearl pin from one of my new favorite blogs, Tabby Craft Designs. I just happened to have the baskets on order for another project (which you will see here later!) when I saw this idea on Tab's blog - genius!! I hope you like the card and TFL! Other materials used: patterned paper - Basic Grey (Porcelain 6x6 paper pad); sentiment - Whiff of Joy; Dark Chocolate ink - Papertrey Ink; circle and scalloped circle Nestabilities; pearls and silver basket - Firemountain gems; pearl pin - local craft store. I got picked to be on the La-La Land Crafts Design Team!! Yippeeeeeee!!! I fell in love with the stamps as soon as I saw the sneak peeks and I'm just thrilled that I'll be able to share these great new images with you! 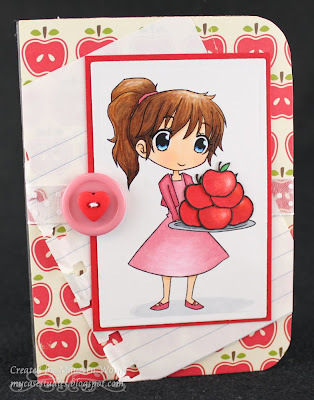 A couple things before I go: Irina is generously giving away more blog candy where you can win THREE stamps of your choice from La-La Land Crafts, plus a lot of other great stuff! Check out this post for a chance to win! And finally - don't forget about the Grand Opening of La-La Land Crafts, all of the details can be found at this post. The other challenges for this card were the Roses on Paper Challenge 17 - use hearts (and also one of the specified stamp companies) and the Cupcake Inspiration Challenge #18, from which I was inspired to use an owl, the colors blue and green, hearts and flowers. I used The Greeting Farm's Forest Friends set because it is one of the specified companies for Roses on Paper and also because the owl is super cute! I colored the owl with Copics and then cut it and the attached branch out completely. Here's a little tip - if your cutting isn't perfect (and mine never is!) and you have some slivers of white showing, instead of trying to cut them off and risk cutting too much (which always happens to me), I just color over the white with a matching Copic. In this case I used a dark brown on the owl and a dark green on the branch because my black tends to bleed too much. 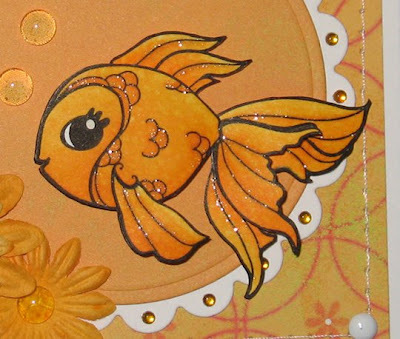 For the rest of the card, I did a bunch of Stardust glitter pen on the top flower and also all over the dots on the patterned paper. The little rhinestones on the corners of the white square are hearts and I also used a hanging heart charm. The sentiment is from the same set and I inked the edges of each piece so they wouldn't be so stark white. I hope you like it and TFL! Other materials used: patterned paper - DCWV Latte stack; ribbon - May Arts; flowers - Prima; Ripe Avocado ink - Papertrey Ink; brads - Pink Hedgehog Paper Crafts; circle and petite scalloped circle Nestabilities; tiny rhinestones - eBay; bead cap and chain - Firemountain Gems; charm from stash. 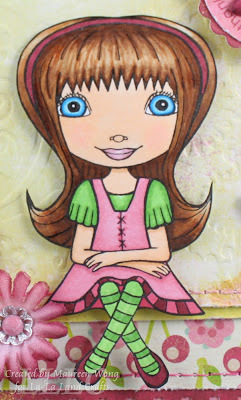 I did multiple layers of the little fairy and the flower and added a bunch of Stickles glitter glue for sparkle. Our Design Element was buttons and bows so I made sure to add those in! I also sponged the edges of the main panel with light yellow ink. Timeless Tuesday - Hardware (use any kind of metal). I used a few different sorts for my flowers with charm. Papertake Weekly - Four Seasons. My card represents Spring. Other materials used: patterned paper - Basic Grey (Urban Prairie collection); Barely Banana ink - Stampin' Up! ; flowers - Prima; buttons - Papertrey Ink; ribbon - May Arts; petite ovals and petite scalloped ovals Nestabilities; half pearls - MimiLolo Etsy store; chain and bead cap - Firemountain Gems; charm - eBay.